It's hard to believe that just a few weeks ago it was so bitter cold outside we were forced to take these pictures indoors. But it did give us a fun, creative way to play with the light and colors inside the house to produce some unique photos. Now that it is perfectly acceptable to wear white before Memorial Day, and the slush melted enough so that I no longer had to worry about getting grime on my pretty white jeans, I decided to give one of the winter white and black combos I've been seeing all over the internet a try. 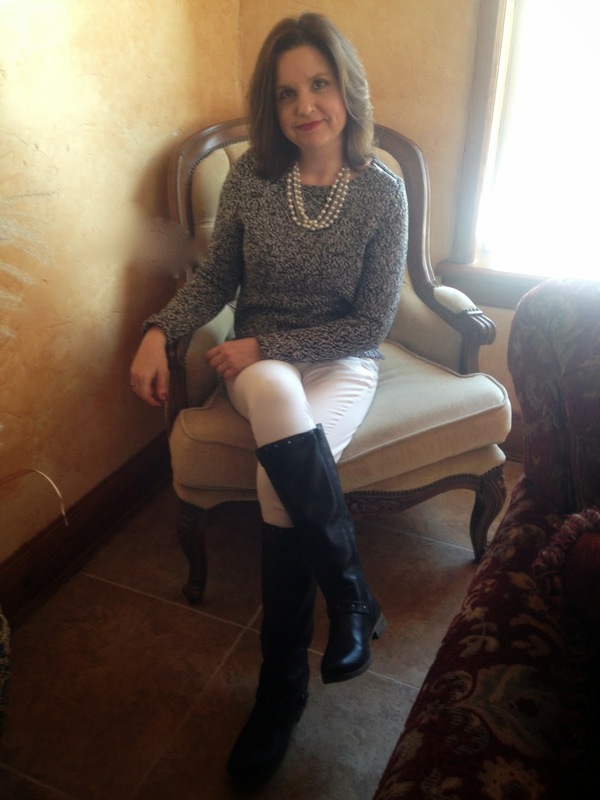 I wore my white skinny jeans from a.n.a, a Liz Claiborne black/grey sweater, and black boots. I really enjoyed wearing this outfit. It was refreshing to wear white again, yet it was still warm and cozy for colder temperatures. I forgot to take a detail photograph of the shoulder on this sweater. It has a cute little zipper on the left shoulder. It was the main reason I bought the sweater…little details like that make all the difference to me when choosing what to purchase. And then I forgot to photograph it. But, you can see it a little bit in the picture below and in the first picture where I am sitting in the chair. I added a pearl necklace to feminize the outfit and tone down the black and the rugged boots a bit. Here's is a close up of the marbled texture of the sweater. I bought the sweater for less than $10.00 at one of JCP's winter close out sales, so it is no longer available. January truly is the best time of the year for clothes shopping. The sales are amazing! 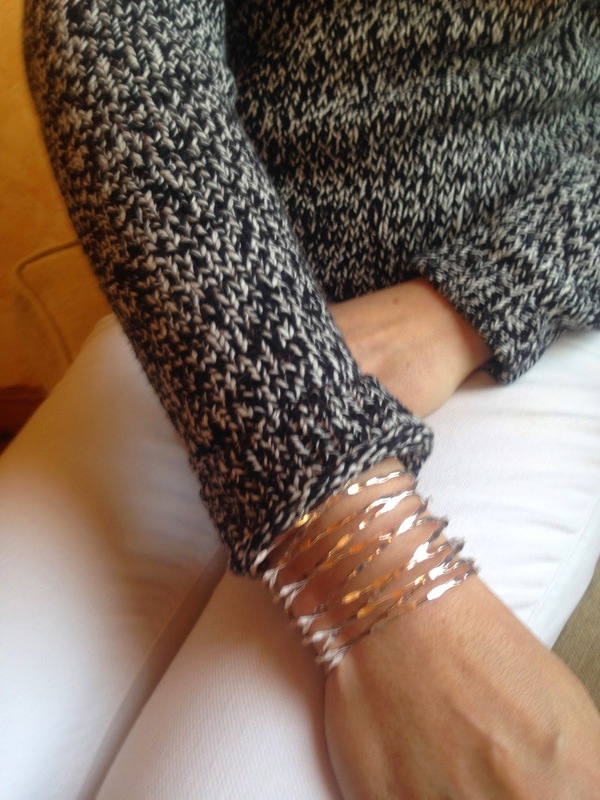 My other jewelry was this lovely, silver bangle. I love that it is wide, and the strands have this bent/twisted/hammered look, yet it is still shiny and dainty. Well hopefully this will be the last winter look I have to show you and I can finally start wearing some spring clothes. Although, it does look like the temperatures will be dropping and we even have some snow in the forecast for Monday. So we'll see. We can only dream. Linking Up with: Casual Friday and Fashion Should Be Fun. Fabulous look, Amy! 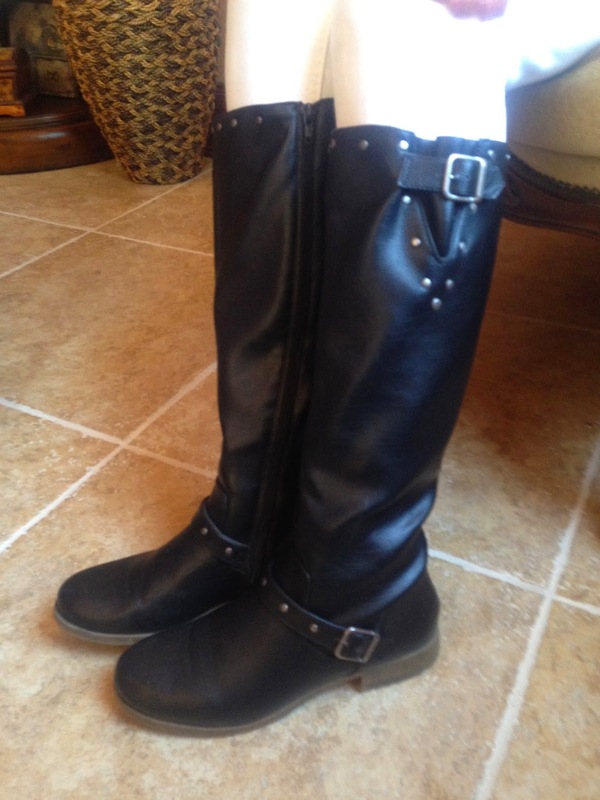 I really like how white jeans and black boots look together - so nice and crisp. Your marled sweater sweater ties the two together wonderfully. Yes, little details make all the difference! Also you know I love a good JCP sale - they are the best! Have a lovely weekend, Amy! Gorgeous outfit, Amy! This look is one of my favorites! Like you, I've seen it a few places around the net but I love it every time. It is so flattering on you. What a steal on that sweater! Such a smart layering and chic, elegant look! I love the added necklace and silver bangle. The white jeans are so on point right now! If I ever find a pair that I think are flattering I'm in! 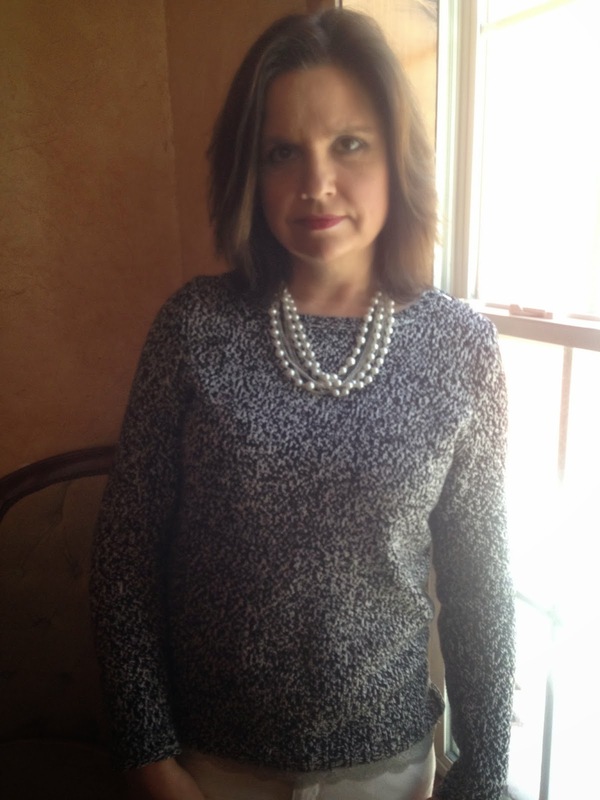 Great look and thanks for sharing with Fun Fashion Friday! 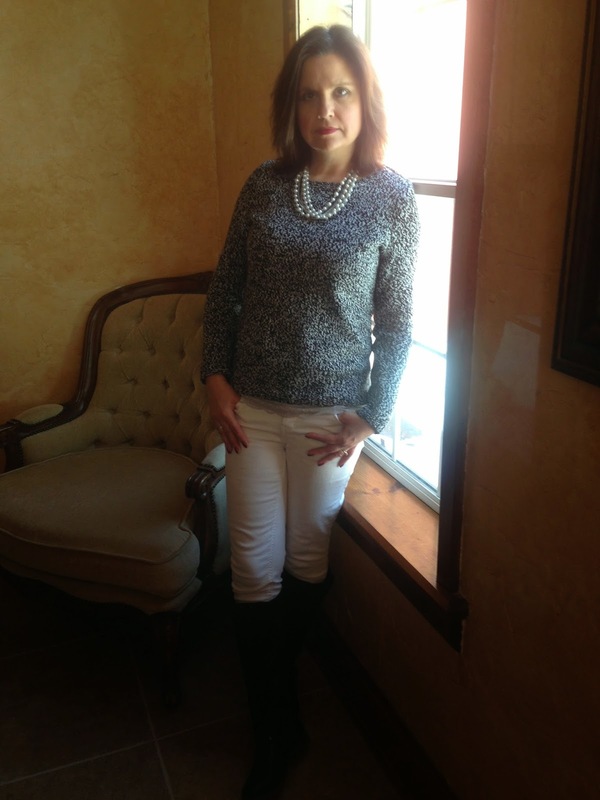 Love white year round, you look great mixing the white jeans with the grey sweater and those boots are fab! I am such a fan of white jeans and you look fabulous in them!! Great styling.